ROCKLAND, Mass. – Even though it was very early, things weren’t looking good for the top-seeded Rocketeers. Dartmouth had its first four batters reach on three straight walks and a double, resulting in a quick 1-0 advantage. But that was all the damage the Indians did as catcher Zach DeMattio erased the leadoff walk trying to steal second and starting pitcher Peter Cohen settled in to get two outs with runners on second and third. And in the bottom half, North had a swift answer. The Rocketeers scored three runs, assuming a lead that they never relinquished, and sparked what would be an offensive showcase that resulted in a 20-2 win. North Attleboro advances to the D2 South Final to play Hockomock rival Oliver Ames. Big Red senior starting pitcher Peter Cohen not only had to face the top of a talented Dartmouth lineup to start the game but also had to deal with a hole near the rubber on the pitching – a mound issue that also gave Oliver Ames starter Michael Mulrean issues in the nightcap. Cohen walked Dylan Pacheco to start the game but he was erased at second by a perfect throw from DeMattio. But Dartmouth’s Brett Abreu and Hunter Pimental also drew walks. Eric Sylvia sent one to the outfield for a double to bring one run in and put runners on second and third. But Cohen finally settled in, getting a pair of popups in the infield to end the top of the first down just 1-0. “It wasn’t a matter of Peter’s ability, he was really struggling with the mound,” said North Attleboro coach Mike Hart. “He figured it out and battled, that’s the senior in him. I’ve said it before, he’s a bulldog. I knew he’d find a way to figure it out to stay in the game, he was excellent from there on out. The momentum the Rocketeers seemed to get from allowing just one run seemed to carry over to the offensive side. 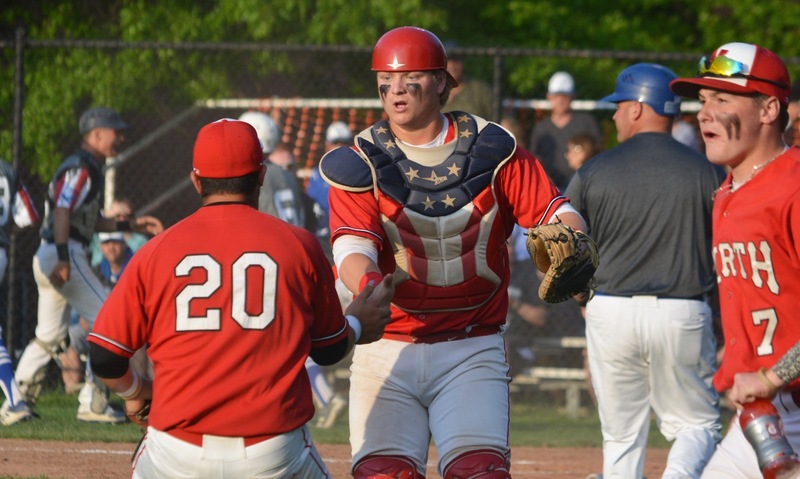 Brendan McHugh reached on an error – one of seven miscues for the Indians on the day – and Nick Sinacola walked to quickly put runners on first and second for North. As he has done all season, DeMattio delivered at the plate but crushing a two-run triple to right center field. Two batters later, DeMattio came home on a hard hit ground ball from Nick Raneri to make it 3-0. Cohen showed he had settled in by needing just 11 pitches in the top of the second inning, striking out the side. And North Attleboro kept things rolling in the bottom of the second, exploding for seven runs. Three straight singles from Aidan Harding, Shawn Watters, and McHugh loaded the bases with no outs. Sinacola’s hard-hit grounder allowed two runs to score and put runners on the corners. DeMattio followed with an RBI single to plate McHugh, and Sinacola came home on a sac fly from Pearce. Raneri reached on an error, allowing DeMattio to score to make it 8-1. North’s offense kept rolling with a single from Kyle Bolger, who then stole second. Harding then reached on an error and two runs came in for a 10-1 advantage. “I think we did a good job putting the ball in play,” Hart said. “Obviously it helps if the other day has some errors. We’ve done well offensively this year but we just try to focus on our at-bats and attacking the baseball instead of what’s happening in the field. Dartmouth added a second run in the top of the third. Pacheco singled, advanced to second after a walk, took third after Cohen induced a double play, and scored on a wild pitch. North’s offense went down in order (for the only time in the game) in the bottom of the third but was right back at in the fourth. Nate Pearce struck out but raced to first on a dropped third strike and forced a high throw, allowing him to take second. A line drive double from Raneri made it 11-2, and a two-out single from Harding scored Raneri in from third. The Rocketeers continued to stay hot at the plate and pushed across five more runs in the fifth inning. Sinacola doubled and DeMattio reached on an error to put runners on the corners. After DeMattio stole second, Pearce was intentionally walked and Raneri made the Indians pay with a two-run single through the right side. Bolger was intentionally walked to load the bases again and Harding delivered with a two-run single. Watters followed with an RBI single to make it 17-2. The teams came off the field and started to leave the dugouts because of the 15-run mercy run. The umps called both teams back saying the rule did not apply. A 30-minute delay occurred as officials figured it out. 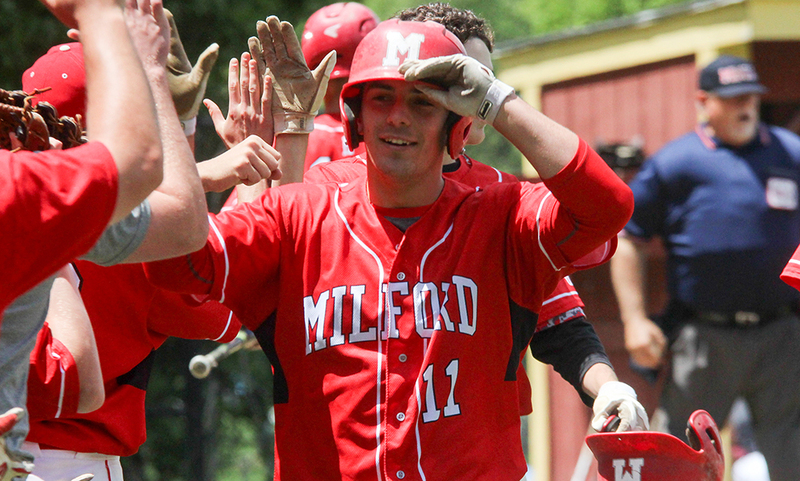 In the end, it was decided that the MIAA 15-run mercy run does not apply past the quarterfinal round. After the long break, freshman Dennis Colleran took over on the mound for Cohen (5 IP, 2 ER, 2 H, 5 BB, 4 K). Colleran retired the side in order in his first varsity experience. North tacked on three more runs in the bottom of the sixth inning. Ryan Pasquel was hit by a pitch and took second on a hit from Matt Seavey. Todd Robinson’s bloop single pushed Pasquel to third but Dartmouth got the force out at second. Bolger drove Pasquel in, Jake Palmer brought Robinson home with a single, and Harding scored Bolger with a base hit. Ben Arrighi worked around a one-out walk, striking out a pair in the top of the seventh to end the game. “Our guys came ready to play, they were really excited to get after it today,” Hart said. 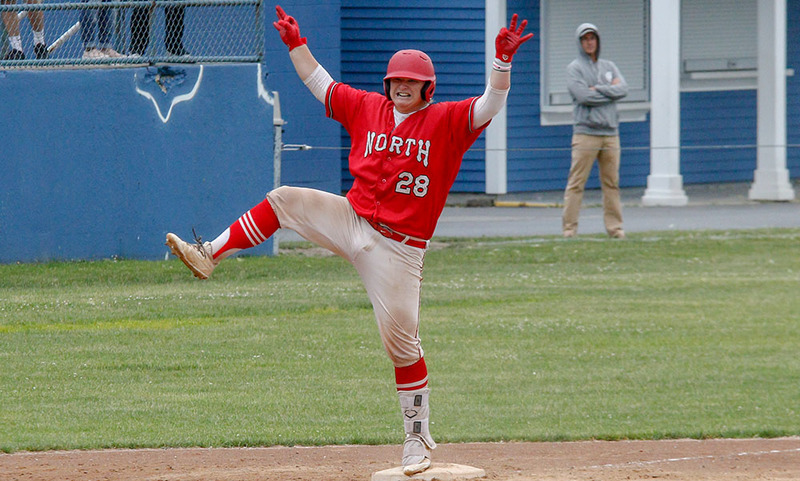 North Attleboro baseball (20-2) will take on Oliver Ames in the D2 South Final on Saturday at 10:00AM at Campanelli Stadium.